1. What is a Wavewalk® 500 Saddle Bracket? The Wavewalk® 500 saddle bracket is a U shaped, multi purpose accessory that can be attached to the Wavewalk® 500 kayak saddle. The saddle bracket’s horizontal beam fits exactly in the groove between two W500 saddle sections, and its two vertical beams fit the saddle sides. A saddle bracket is used to reinforce the saddle in order to increase rigidity and load capacity. In such case, the bracket is inserted into the last available saddle groove at the cockpit’s rear end, and attached permanently to the saddle from below, by means of two screws going into its horizontal beam. 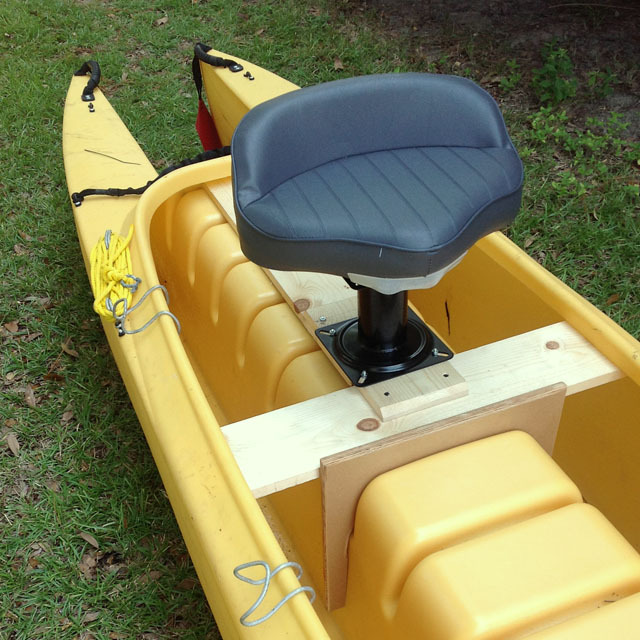 Since November 2013 Wavewalk® 500 kayaks are outfitted with such a saddle bracket standard. Any W500 kayak that doesn’t feature such a bracket, or lost it, can be outfitted with one. Attaching the saddle bracket to the saddle from below, using two screws. A motor’s propeller shaft is seen behind the cockpit. The new type of saddle bracket is nicknamed ‘Relaxed Fit’ and its two legs are located at a 13.75″ distance from each other. 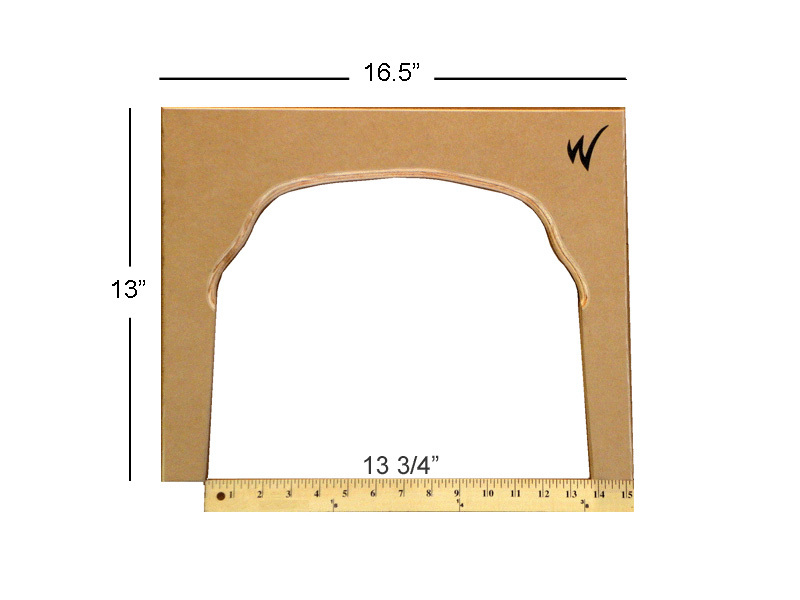 This saddle bracket is cut out of one piece of 3/4″ thick Medium Density Overlay (MDO) – an exterior, water resistant material composed of wood and synthetic resin. When the saddle bracket is installed in the kayak permanently, its horizontal beam protrudes a little over 1.5″ from the top surface of the saddle. The saddle bracket is lightweight (less than 2 lbs), and non-intrusive. It can be painted with special paint for outdoor plastic, such as Krylon Fusion spray paint. Regular paint doesn’t adhere well to its surface. This bracket takes advantage of the natural flex offered by the Polyethylene resin from which most kayaks today including the W500 are molded. The ‘Relaxed Fit’ bracket allows the W500 kayak’s twin hulls to splay about 1/2″ to each side, and by that have the user gain from a slight increase in the kayak’s lateral stability, as the kayak’s bottom width increases by one inch, from 29″ to 30″. The presence of a bracket close to the entrance of the hull tips doesn’t prevent the person who fishes out of this kayak from storing their fishing and camping gear in the that space, except for large size rigid objects, such as a live bait tank, or a plastic cooler. However, the W fishing kayak offers plenty of storage space (66 gallons in total), and finding room for such gear and other large size objects (even a fish tank) on board is not a problem at all. The W500 kayak was the world’s stablest kayak, before we came out with the W700, and the only one that offered stand up fishing and paddling in full confidence, as well as in moving water. Anglers looking to stand higher than on the bottom of the W500 kayak’s hulls, and are willing to sacrifice stability, comfort and safety for that matter, can outfit their W500 kayak with a platform resting on top of two brackets. One of these brackets can be permanently attached to the saddle, and the other can be non-attached, or they can both be non attached. Some anglers think that poling is better done from the boat’s rear end, and as far as paddling goes, it is easier and more effective when the kayaker is located in the middle of the cockpit. It makes sense to design the platform for comfort, and therefore make it as roomy as possible. The following figures show how to build a platform that’s about 22″ x 22″, and offers to stand about 17″ higher than the bottom of the hulls. This is to say that a 200 lbs angler standing on top of it would be standing about 13″ above waterline and their W kayak would draft 4″ if the platform was located in the middle of the kayak. Since the platform configuration shown below is located at the rear end of the cockpit, the same 200 lbs angler standing on it would be standing 10-11 inches above waterline, and their kayak would draft 6-7 inches at the stern. The above image (Figure 4) shows a fishing and poling platform extending over six saddle sections, that is half of the cockpit’s length. Drill two small-diameter vertical lead holes in the plastic gusset (arched rib) inside which you will install the Saddle Bracket. Place the bracket firmly inside the gusset, and attach with two screws (min. screw length 1.5″). Seal the screws with Goop (watertight, all-purpose adhesive). Since anglers who like to push pole through the flats prefer to stand in the back of the kayak’s cockpit, adding the angler’s weight to that of the outboard motor on the same end can be counterproductive, because it would make the kayak draft more. So, instead of mounting the poling platform in the back of the cockpit, it would make sense to mount it in the front, and use the kayak’s bow as a stern while poling – Nothing could be easier, since the W is symmetrical front and back. The bonus would be that in this mode the outboard motor’s weight would offset some of the angler’s weight, since motor an angler would be on opposite ends of the cockpit, and that would make the kayak draft less. Another bonus from such a setup could be that while the angler isn’t using the platform for poling, and they’re sitting or standing facing it, they could use it as a ‘workbench’, and fly anglers could put a stripping basket on top. Quick question.. just wanted to make sure – if I wanted to raise the saddle like I see in this picture, would I have to make it narrower the higher I place it? Yes, and other factors to consider would be your legs’ length and width, as well as your weight, since heavy people feel less comfortable on narrow saddles, such as bikes’ saddles. When push comes to shove, the W saddle is really a big success, since kids as young as 2 years old as well as people in their seventies, and big & tall people all find it very comfortable, even in long trips. I pole my boat a lot and mostly in pretty shallow waters of flooded grass. I prefer to keep my platform close to the middle or slightly aft of middle. This allow a shallower draft and also you can reverse directions easy as turning your feed 180 degrees. Great multipurpose design on the saddles Yoav, I use something similar but not as extensive on my platform. I run my platform an inch over each edge of the splash guard so I can have a wide stance when needed. I wonder if you could explain to me a few things about poling..
What’s the advantage, if any, and why is it that I hardly ever see anyone poling their yak? Is it hard? A person standing and push poling exerts more power on the push pole than they can normally exert on a paddle, whether they’re seated or standing up. 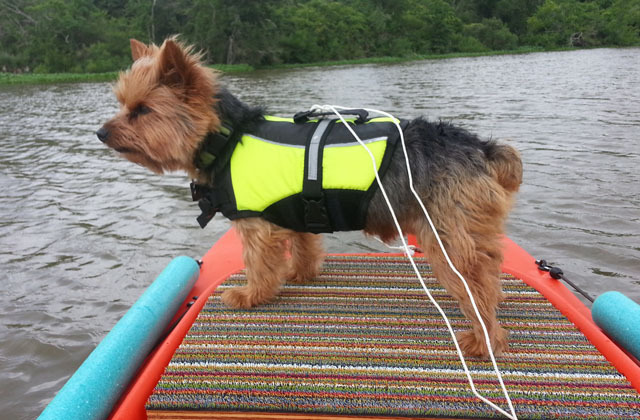 Generally, poling is slower than paddling, and it works only in shallow, flat water. Poling can be more effective than paddling if the boat needs to move through muddy water or thick grass, which is the case with Kevin’s fishing expeditions in Florida’s flood grass flats. From a stability standpoint, the fact that the poling angler can lean on their push pole, which itself is pushing against the muddy bottom adds some stability to them, compared to stand up paddling. However, you’d better push pole while standing on the bottom of your W kayak’s hulls, rather than on top of a poling platform, especially if you’re a big & tall person.